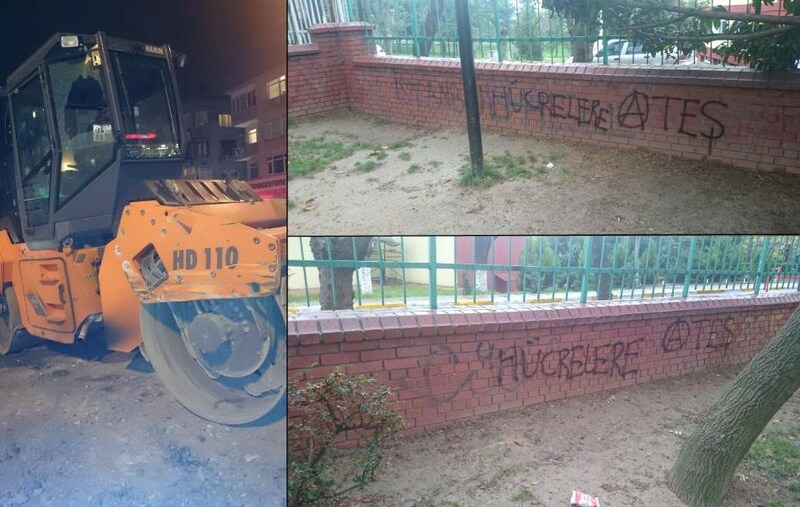 In the night of 1st of December, we broke down windows of a road roller and cut its cables in the Kocasinan district of Istanbul, with the intention to show our solidarity to anarchist prisoner Nikos Romanos, who is on hunger strike since 24 days and then to Yannis Michailidis, Andreas-Dimitris Bourzoukos, and Dimitris Politis who have started a hunger strike in support of Nikos Romanos in the Greek prisons. Then we spray-painted some slogans on a wall close to the target: “Nikos Romanos” and “Fire to the prison cells“. the swamp of liberal opposition. A solidarity demo for the Kozani 4 took place on 23 Feb 2013 in Veria, Greece. Around 400 people attended the demo which took place in the midst of repressive police occupation. The ‘Kozani 4’ are 4 remanded anarchists who are accused of double robbery in the towns of Velventos and Kozani. International revolutionary solidarity to the 4 arrested comrades of Kozani double bank robbery. Prison cannot hold freedom’s dreams, which escape through the bars to continue the attacks. Every night that a captured brother or sister spends behind bars becomes more fires in the night, more stones through façades, hundreds of flyposters, graffiti, and various other outbreaks of insurrectionary vengeance. Respect and complicity with the determination and courage of those who rob banks. The villains are those who own and protect them. Capital remains our enemy – Expropriation is dignity – The war continues on every level. Let’s target again the concepts, individuals, strong-houses and mechanisms of the system and eliminate their world. An incendiary hug to the comrades Nikos Romanos, Dimitris Politis, Andreas-Dimitris Mpourzoukos and Giannis Michailidis. Also see this: Statement by CCF/FAI Imprisoned Cell. We run toward our escape, whilst around us a full-out manhunt is playing out. Behind us lies a life that is predetermined, carved from the hands of the sovereign, with the aim for us to internalise submission as an objective condition, to morally legitimise systems of law and rules, to equalise the individual with a statistical logic of numbers. Ahead of us, the world of our “utopian” fantasies that is conquered with violence alone. One life, one chance and determined choices. Gaze at the gap in-between the clouds and jump, because the fall was never a more certain choice. And so, on that Friday morning, we attacked the two targets split in two teams. Our aim from the upstart was to take the money from both safes, as it did indeed happen. During our escape, a series of unfortunate events and mistaken handling of these lead to the exposure both of our vehicle as well as our direction to the police.